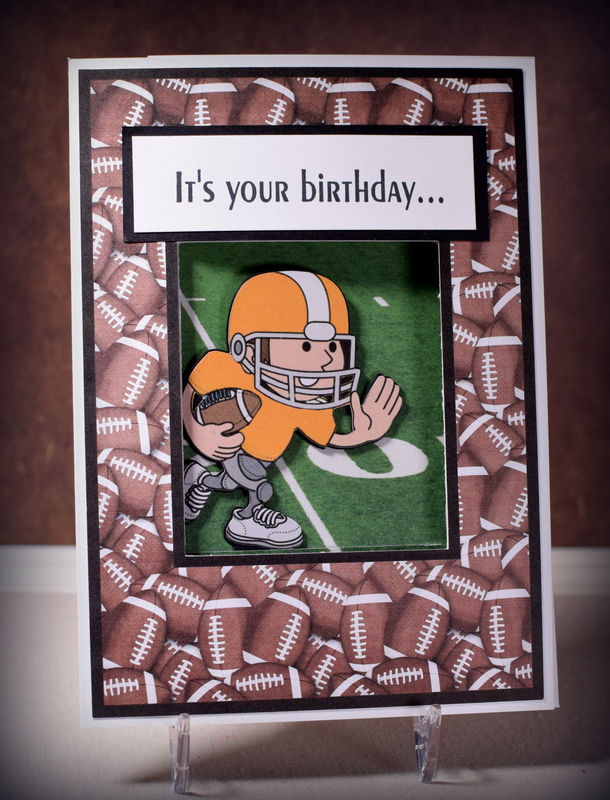 Football Slider Birthday Card | I Played With Paper Today! In a recent post, I shared an interactive card that I had made for my husband for our anniversary. The card had an element that slid from left to right when the card was opened. (HERE is a tutorial on how I made it.) 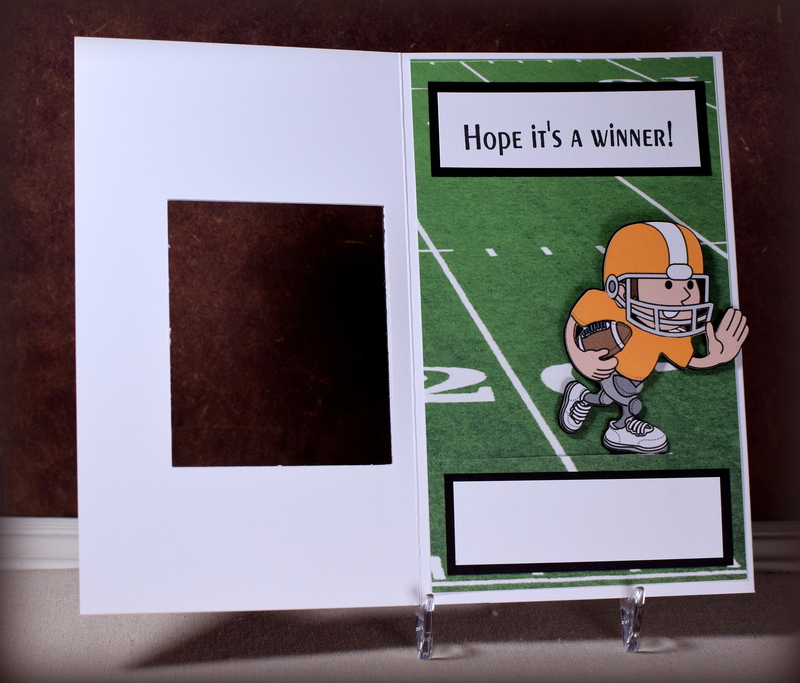 This type of card can be made with a variety of sliding elements, and here is another sample I created with an image of a football player. For this one, I created a cut out window on the front. When the card is closed, you can see a portion of the inside scene. I made the border/frame kind of wide so there is room inside to put a sentiment and signature panel that does not show through the window when the card is closed. A piece of acetate covers the opening. 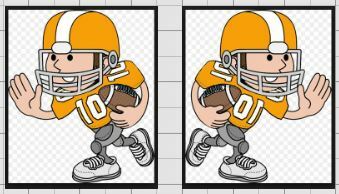 The football player was a google clipart image that I traced and cut with my Silhouette. I needed him to “run” to the right so I flipped the image which I thought was quite clever until I realized that the numbers on his jersey flipped also and were backwards. Of course I didn’t notice this until the card was done and I was ready to post! I needed to go back and doctor the original image with my Silhouette software to remove the numbers, create a new die cut, and layer it over the old one. Ugh!!! Note to self… avoid images with letters and numbers when using mirror images. The football field was also a google image. There were many field choices; I chose one that put my player close to his end zone. The greeting and inside sentiment were stamped with Momento Tuxedo Black ink and were both from custom stamps I had made at rubberstamps.net I’ve had stamps made there before, but this time, I realized that you don’t need to order individual stamps for each greeting or short sentiment. You can put several greetings/sentiments (as different lines of text) on the same stamp and cut them apart when they arrive. A big money saver! Wow! This is super amazing! What a fun card to receive I am sure. Any football fan would love it. That is a cute football player image too. That is super duper cool! What football fan wouldn’t love this! Great work! Pingback: Slider Card Tutorial | I Played With Paper Today!